Whether you simply don't have the space inside your car or you would rather not clutter your cargo area, a roof rack will provide you with a space-saving alternative for carrying cargo and equipment. You can mount large and unwieldy items that will not fit inside your car or SUV. You can fill a rooftop cargo carrier with wet or dirty gear to ensure that your trunk or cargo area remains clean and dry. And you can quickly and easily get your sporting gear to the trail, beach, lake or mountain. The first step when choosing a roof-rack system is determining what it is that you want to carry or, more precisely, how you intend to use your rack. If you're a contractor, for example, and you may end up using your roof rack for work equipment, then Rhino-Rack's Heavy-Duty square crossbars will likely be a good choice. If, on the other hand, you wish to carry only a couple of bikes, then any bars will suffice. Most roof-rack-mounted carriers and accessories will fit nearly all square, round, aero and elliptical bars on the market. But if you have a specific idea of what you want to transport, then you may want to consider choosing your carrier first so you don't run into any compatibility issues. 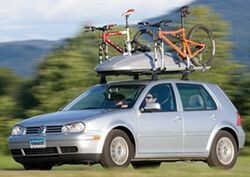 What Is a Roof Rack Able to Carry? The type and amount of cargo or equipment that you can carry with your roof rack is largely dependent on your specific application and the type(s) of carriers that you choose. To a certain extent, you can estimate how many or how few carriers you can fit onto your rack based on the crossbar length. To determine your roof's maximum weight capacity, check your vehicle's owner's manual. Typically, your vehicle will be the limiting factor. What Type of Roof Rack is Right for Your Vehicle? The other factor that will certainly affect what you can carry on your vehicle's roof is the roof itself. We have an in-house Roof Rack Application Guide that will help you determine which rack systems are best suited for your vehicle. Most setups are vehicle specific, from the recommended length of the crossbars to the custom foot packs. Typically, you will have a few choices in roof-rack systems so that can you pick your crossbar style. One area in which you will not have as many choices, though, is the mounting kits, most of which are vehicle specific. Our fitguide will walk you through the process of finding the perfect rack for your application, but before looking up your vehicle, you need to be able to differentiate between the different roof types. This will help to ensure that you get a kit that offers a perfect fit. Vehicles with naked roofs have no tracks or rails. 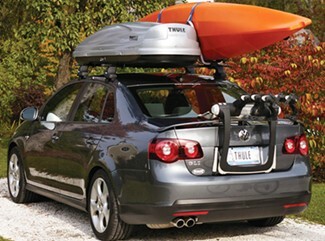 With a naked roof, you need a fit kit, foot pack and crossbars to create a complete roof-rack system. 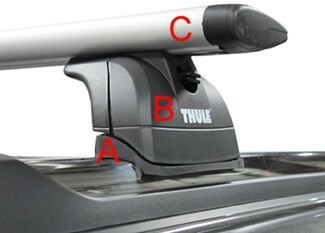 The etrailer.com fitguide will automatically group these items together for you to make choosing and ordering your roof rack easy. These pictures detail the components required for a naked-roof vehicle. A. Each fit kit is custom-designed to create the best, strongest fit for your specific vehicle. These kits include pads that contour to your vehicle's roof and sturdy clips that fasten to the outer edges of your roof, either by connecting to pre-drilled holes (as seen in the first image) or by clamping around the door jamb (as in the second image). B. The podium-style foot pack includes four feet that connect to the custom fit kit and provide attachment points for the roof-rack crossbars. C. The crossbars (or load bars) are the last part of the system to be installed. 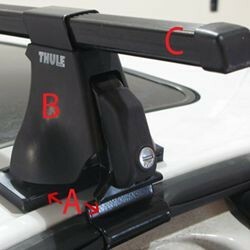 These provide the usable portion of your roof-rack system where any carriers or accessories will be mounted. 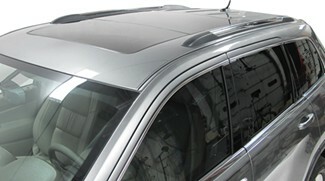 Raised side rails are most common on minivans and SUVs. They run from front to back on your vehicle and can provide attachment points for an aftermarket roof-rack system. 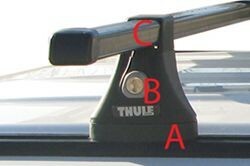 To mount a roof rack on a vehicle with this type of roof, you will need a foot pack and crossbars. The pictures above detail the components required for a vehicle with raised side rails. A. The foot pack for factory rails includes four feet that clamp onto or wrap around your vehicle's side rails and provide mounting points for the roof-rack crossbars. B. The crossbars (or load bars) are the last part of the system to be installed. 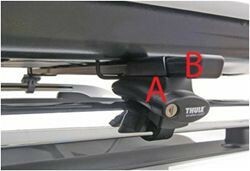 These provide the usable portion of your roof-rack system where any carriers or accessories will be mounted. Factory flush rails run from front to back on your vehicle and may provide attachment points for an aftermarket roof-rack system. 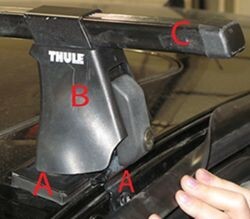 To mount a roof rack on a vehicle with this type of roof, you will need a fit kit, foot pack and crossbars. The pictures above detail the components required for a vehicle with flush factory rails. A. Each fit kit is custom-designed to create the best, strongest fit for your specific vehicle. These kits mount to your factory rails. Factory flat tracks run from front to back on your vehicle and can provide attachment points for an aftermarket roof-rack system. To mount a roof rack on a vehicle with this type of roof, you will need a fit kit, foot pack and crossbars. The pictures above detail the components required for a vehicle with flat tracks. A. Each fit kit is custom-designed to create the best, strongest fit for your specific vehicle. These kits mount to your factory track rack. If your vehicle came equipped with a roof rack that has crossbars, you may not need an aftermarket roof-rack system. Most roof-rack-mounted carriers and accessories on the market will fit factory load bars. If the carrier that you would like to use does not fit your factory bars, adapters may be available. Be sure to check your owner's manual for the capacity of your factory roof-rack system. Many OEM racks are designed more for aesthetics than utility and, therefore, are not built to support much weight. If you intend to use your roof rack for heavy loads, you may want to add aftermarket crossbars to boost the carrying capacity of your system. To do this, follow the instructions for Factory-Installed Raised Side Rails. 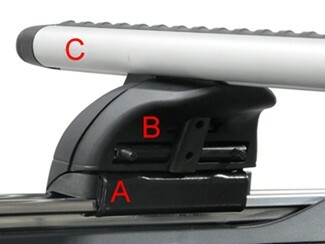 The fun part of choosing an aftermarket roof rack is picking the type of crossbars that you want your system to have. Sometimes this will be determined by the application or what you intend to use the rack for. For example, if you want to carry lumber or ladders with your system, Rhino-Rack's Heavy-Duty bars might be a good fit. There are multiple accessories that cater more to contractors and fit only these bars. For the most part, roof-rack-mounted accessories and carriers that clamp onto or wrap around load bars will fit all types of bars. There are always exceptions though, so be sure to read accessory product descriptions carefully when determining compatibility.